Arthritis describes a joint that is inflamed. The big toe can be affected by inflammatory arthritis, when the body attacks one component of the joint, or by osteoarthritis, when wear and tear changes occur within the joint. The wear and change variety is commonly called Hallux Rigidus, as the joint becomes stiff. 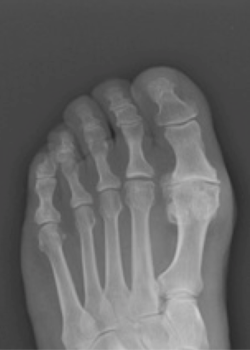 Big toe arthritis is most commonly the result of osteoarthritis. The joint can become painful due to chemicals released by damage to the joint. Extra bone forms around the joint. This can limit the movement of the joint. Also, a nerve running over the joint becomes stretched, especially with downward bending of the toe. Movement of the joint is required to allow normal walking. If the joint is painful, the foot may compensate by adopting an abnormal position, such as walking on the outer border of the foot. The extra pressure on the balls of the foot can be painful. Also, if upward bending is limited, the foot tends to turn outwards to allow ‘toeing off’ in walking. The joint can become progressively more painful, and the extra bone around the joint may prevent normally sized shoes being worn. 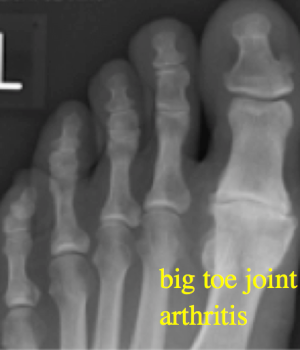 There are various options for treatment of arthritis of the big toe. 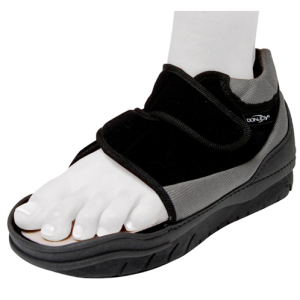 Firstly, adaptations to shoewear are possible, although this option does not suit everyone. The pain comes from the joint from wear and tear. It can also arise due to high pressure at the top of the joint, limited movement and extra bone that forms around the joint as a reaction to the damage. Surgery can stiffen the joint, to make it pain free. This can be performed as a keyhole procedure. This is considered the most reliable operation for advanced arthritis. Other options include shaving of the joint for less advanced arthritis with a keyhole procedure. This can buy time, but can give several years of pain relief. Another option is an artificial joint. This is an attractive option, as if offers the best of both worlds – a joint that is mobile and pain free. However, a lot of artificial joints are not reliable – as many as 40% of patients have problems, and they can result in the worst of both worlds – a stiff joint that continues to cause pain. Silicone joint replacements can result in erosion of the bone, and if there is recurrent pain, this makes dealing with this complication problematic, involving taking bone from the pelvis to fill in any holes that are created by the reaction to the silicone. Currently, there is one joint replacement available that has demonstrated very good results. 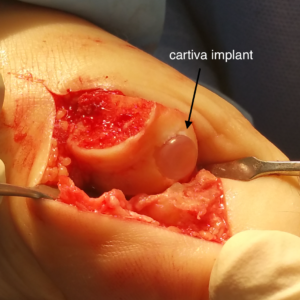 This is called the Cartiva joint replacement, and it is specifically for the joints in the ball of the foot. The joint replacement is made of the same material as contact lenses, so it is inert and there is no reaction from the bone. If there are any problems, then there is a simple operation – fusion – which can be performed as there has been no significant bone loss by using this implant. 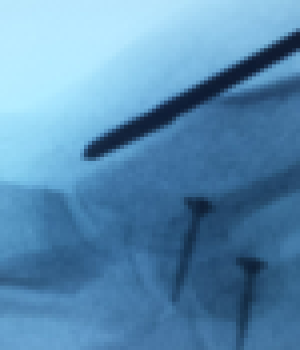 However, the number of these implants that have failed to resolve pain is very small and the vast majority of patients are happy with this procedure. The pictures on the left show a damaged big toe joint, with bare bone where there should be a veneer of cartilage. The next picture shows the Cartiva joint replacement in place. The joint replacement demonstrates improvement in symptoms, which can continue to improve over the first nine months. There will be a scar on the top of the big toe from this surgery, and there will be some associated swelling and discomfort from the procedure – this is not keyhole surgery. The rehabilitation that you require depends on the operation that you have had, and how severe the arthritis is. If you have had the joint shaved , or had a camera examination, or had a joint replacement, then you will have a flat postoperative shoe and you will need to perform exercises immediately. If you have the big toe joint fused, then you will have a wedged heel postoperative shoe, and will not need to perform any exercises. You have been given a special shoe that does not allow you to put weight on the front of the foot. This is because the re-set bone is held together by two screws, and putting weight on it can dislodge the screws holding the bone. You should wear this continuously for the first two weeks, including in bed. After that, you should wear it whenever you are walking, even at home. Crutches are for balance only. Immediately after joint shaving and joint replacement surgery, you should be performing exercises to prevent any joint stiffness. You should hold the toe firmly and bend the toe up as far as possible and then down as far as possible. Repeat this exercise ten times, four times every day. No exercises should be performed on a joint that has been fused, as this may stop the bones from fusing together. After two weeks, you will be seen in the clinic and the stitches will be removed. If you have had a fusion, you will be wearing the special shoe for six weeks, and we will then take an xray. If you have had a joint shaving or replacement, then you can wear flexible soled shoes such as training shoes as soon as the stitches have been removed. I advise that you do not return to work before this, especially if you are on your feet all day at work. Most people can drive after 8 weeks. Remember that not everyone is the same, and some people take a longer time to recover from their surgery. Please request a sick note before you leave hospital, if you need one.